For two and a half years, Subject 684 has been locked underground in a secret government facility, enduring tests and torture. In that time she hasn’t uttered a single word — not even her name. That’s because Alyssa Scott knows that she’s dangerous. She has the ability to infuse power into her words; to make things happen. But she has no idea how to control it … so it’s safer to stay silent. She alone knows what havoc her power can cause. 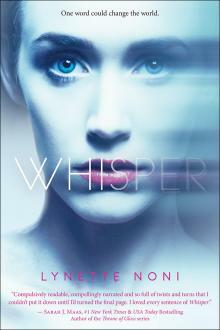 When she is put in the care of the mysterious Landon Ward, her resolve begins to crack. He is kind and seems to care about her; with his help, maybe she can get her life back. Just as she begins to trust him, though, Lyss lets her power loose by accident. She thinks this is a moment of truth, where her secret is finally revealed, but the facility is keeping secrets of its own. Now her ability is at the heart of a sinister plot for vengeance, and Lyss will have to decide whom she will trust … and whom she will help. Well-known throughout her native Australia, Noni knows how to create compelling stories that appeal to devoted fantasy fans and general-interest readers alike. The extended metaphor about finding — and controlling — one’s voice and power will resonate with teens attempting to do just that. The slow-simmering romance, richly imagined world and unexpected plot twists will leave them clamoring for more. © 2019 Kids Can Press LTD. All Rights reserved.